This book is an updated and revised edition of a classic introduction to one of the key periods in modern European history. Olwen Hufton not only illuminates the complex and significant events of the first era in which modernity is recognisable but provides the essential background to the revolutionary period that followed. Olwen Hufton The author is a Leverhulme Professor of History at Oxford, and a Senior Research Fellow at Merton College, Oxford. She was Professor of History at Reading University until 1987 when she became William Kenan Professor of History at Harvard, a post which she held until 1991. From 1991 to 1997 Olwen Hufton was a Professor in the Department of History and Civilisation at the European University Institute in Florence. Part I: Traditional Structures and the Forces of Change. 1. Social and Economic Development. 2. The World of Privilege. 3. The World of Ideas. 4. Armies, Interests and Conflicts. Part II: Central and Eastern Europe. 5. The Holy Roman Empire. Part III: The Western World. 9. Vanished Supremacies: The Iberian Peninsula. 11. France of the Old Regime. 12. The Old Order Changeth. 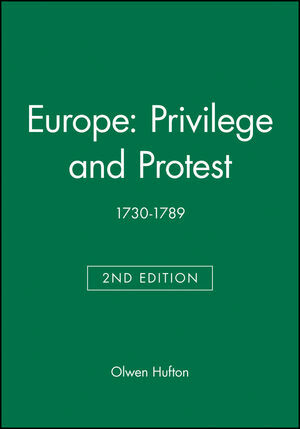 Provides a fascinating account of an important and widely-studied period in modern European history. Highlights significant events that were the prelude to understanding the revolutionary period that followed. New edition is updated and includes a fully revised bibliography.